I don't use broken wheat at home as TH is allergic to it and hence I don't prepare Lapsi rava upma.I make regular Upma only when I am alone as he is not fond of even simple upma.Semiya upma occurs frequently in out breakfast menu when I run out of ideas and need something quick.Though he likes Kharabath I do not make on regular basis because of its ghee dosage. I made this upma recently when my in laws were here last week.I used a finer variety of Lapsi rava as I don't like the very coarse texture of lapsi.I added lot of vegetables to upma to add nutrition to it,it is your wish to make it simple plain upma or to add some zing by adding some veggies and masala to upma. Dry roast lapsi rawa(sooji) in a kadai until the nice aroma starts from it.Remove it from the pan and let it cool.You can even roast rawa in a tsp of ghee which also gives a nice flavor to upma. Microwave the vegetables for 2-3 mins,just par boil them. Add sliced onions and fry them until they are pink in color.Add turmeric powder to it. Add microwaved vegetables to it and fry well. Pour the hot boiling water into the upma kadai where onions and vegetables are fried and let it boil again. Now pour the lapsi rawa with one hand and keep stirring with another hand using a ladle,make sure you make this process very quickly otherwise you will end up having lumpy upma. Roasting the rawa ensures that the upma will not become sticky and also gives a nice flavor,so do not skip this step. You can add 1/4 tsp of Garam masala to add extra zing to upma.Add after roasting the veggies. 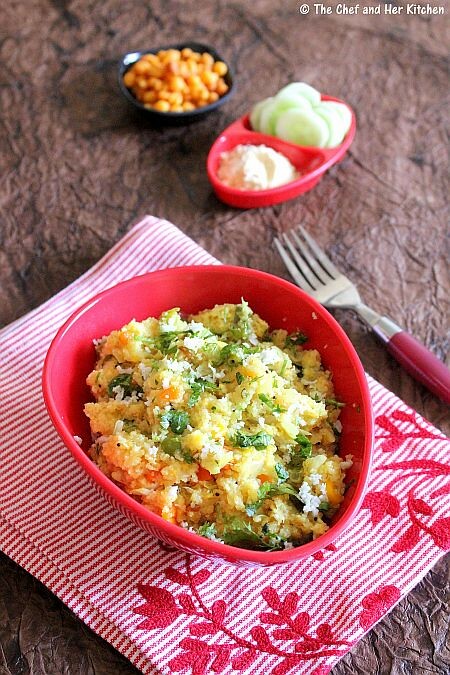 Instead of Lapsi rawa you can use bansi(kesar) rawa or regular rawa and follow the same recipe. Like you I too do not like big grained rava but that is what i get here so I pulse it the mixie to make it fine. Lovely snaps. Broken wheat is not easy to find here. I found some in an Indian store and did not like the way it cooked. I love the broken wheat upma and I have not made it in a while. Looks absolutely delicious. Yummy dish ... perfect for any time of the day.. 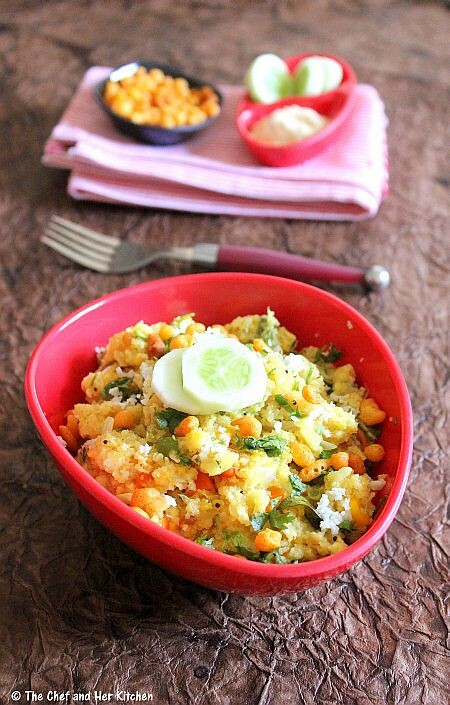 I also use to make this version of upma except adding coconut.My hubby like this a lot. The directions are clear. You make it seem so simple. Off to buy some broken wheat! 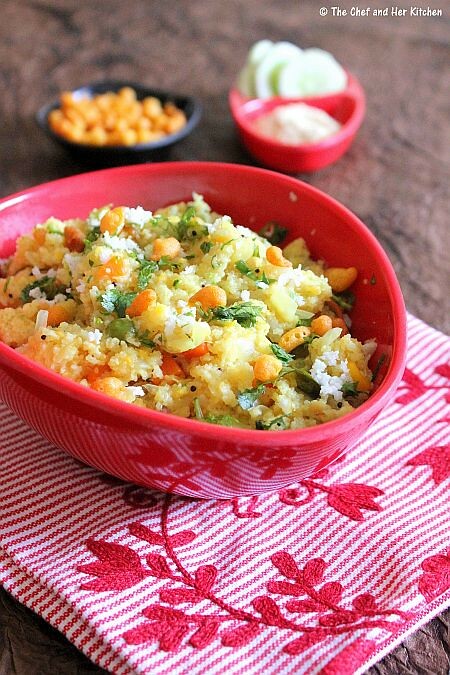 upma looks delicious. so tempting, Can you please let me know what is that brown background. I love that. My kind of food, hearty and definitely healthy. 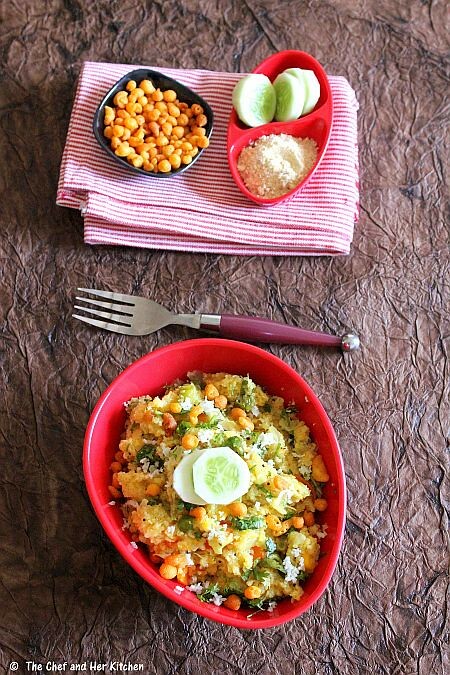 tempting the upma..love the clicks! Lovely clicks. My fav. upma. Do you use tripod to click? 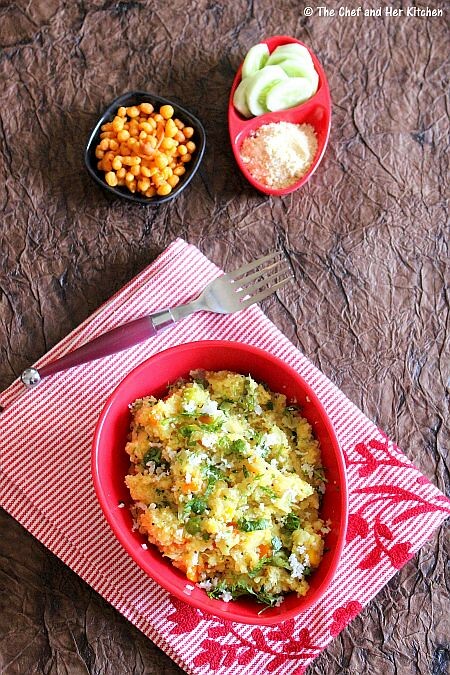 Yummy upma...i never tasted with boondhi,sounds interesting..
Love the upma, lip smacking with some good curds! If someone is allergic to broken wheat, he or she most definitely shouldn't eat semiya or sooji. Or even oats unless they're certified gluten-free, as oats are often cross-contaminated with wheat. I saw a post by someone saying that they cannot find broken wheat. Bulgur wheat found in a regular grocery store works just fine. It didn't work well for me but when my mother made it, it was very fluffy. That part figures, right?